Robert Dickerson is famous for being one of that group of artists that make up the pantheon of "Modern Australian Painting". His name is synonymous with that of Charles Blackman, Arthur Boyd, John Perceval, Albert Tucker and Sidney Nolan, as being part of that group that gave figurative Australian painting it's unique identity - forged in that seminal period from the mid-forties through to the early sixties. Born into a poor Sydney household in 1924, Dickerson worked at various jobs from an early age. His family had a backyard factory in inner Sydney where he helped in the production and distribution of tin mirror backs. By the age of fifteen he was working a forty four hour week in a factory in Annandale - whilst at the same time supplementing his income by boxing professionally under the pseudo name of Bobby Moody. He was later to travel around the state with Jimmy Sharman's boxing troupe during which time he endured thirty seven fights before hanging up his gloves at the age of eighteen. Dickerson joined the R.A.A.F in 1942. He served on the ground staff in Darwin, Dutch East Indies and finally on the island of Morotai in Indonesia. Whilst stationed on Morotai he read Somerset Maugham's "The Moon and Sixpence" which is loosely based on the life of Paul Gauguin. The book inspired him to draw the inhabitants of the island in his spare time. This period was to prove to be an important early step towards his future career as an artist. There is much in Dickerson’s work that can be compared to Gauguin’s paintings of the Tahitian islanders - particularly the simplicity of the drawing, broad areas of pure colours and the paring away of unnecessary detail. On his return to Sydney after the war Dickerson took up factory and labouring jobs for the next ten years; painting and drawing on weekends. During the early fifties he met and became friends with Charles Blackman along with John and Sunday Reed who were art luminaries from Melbourne. These contacts were important in giving him the confidence to pursue more fully, a career as an artist. In November 1955, John Reed, in an article in Ern Malley's Journal (Vol 2), described Dickerson’s work as containing "a new sense of beauty, a new truth". Then in 1956 Reed gave him his first one man exhibition at the Museum of Modern Art and Design in Melbourne. According to Dickerson, only two people turned up to the opening: "One was Arthur Boyd and the other was John Perceval, who wouldn't go anywhere without his dog, I was very lucky - the dog liked me"*. His career as an artist was further encouraged when the National Gallery of Victoria purchased his "Man Asleep on the Steps" in the same year. 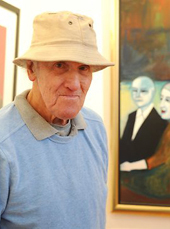 Included in the 1961 exhibition of Australian art at the Whitechapel Gallery, London, Dickerson’s career was in full ascendency - he has continued on throughout the past fifty plus years to cement his reputation as one of Australia's best known and most loved figurative artists. The c1966 painting "Reflection" is a classic example of Dickerson’s work. A moment of reflection playing both on the mood of the figure and the process of reflection through a mirror (perhaps there is a reference here also to Dickerson’s early youth as a maker of tin mirror backs). The figure is pared down to the bare essentials, the drawing economical and the background amorphous and subservient to the aquiline figure of the woman.